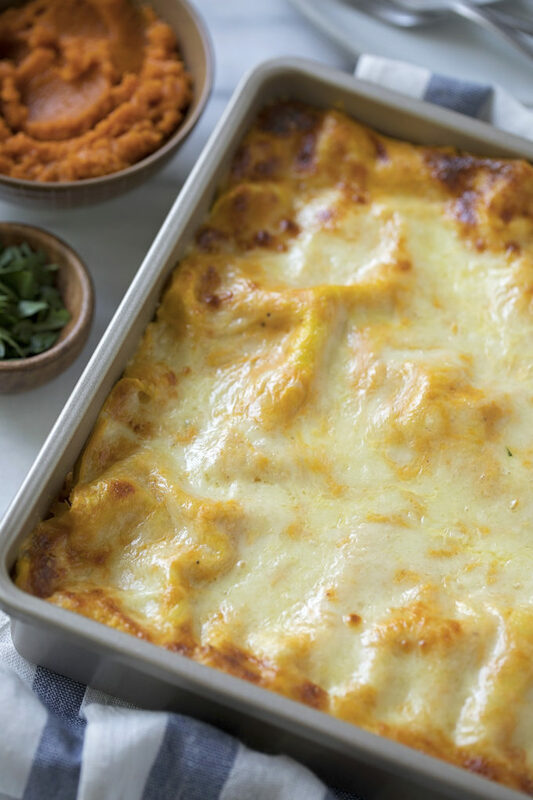 Layers of creamy pumpkin sauce and cheesy sausage filling make this lasagna a perfect comfort food for fall or winter. 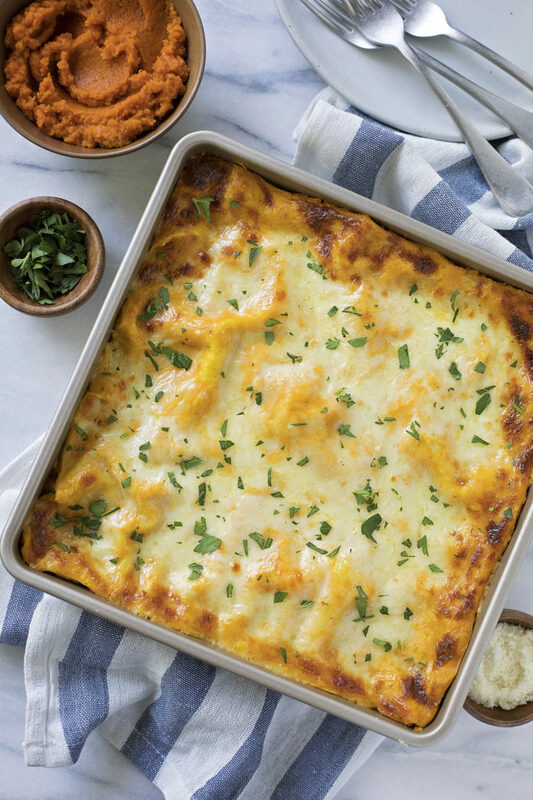 Pumpkin sausage lasagna is the ultimate savory pumpkin dish! In my defense, I’ve been trying to focus more on family, really enjoy the holiday season, and avoid putting unnecessary pressure on myself to do it all. Sometimes that means stepping way from everything blogging for a day, a few days or even a week. It means instead spending 3 hours to edit photos and write a post, I watched a movie instead. Instead of being on social media (or looking at my phone) we went for a walk, worked on an art project, or played a board game. It’s been freeing! 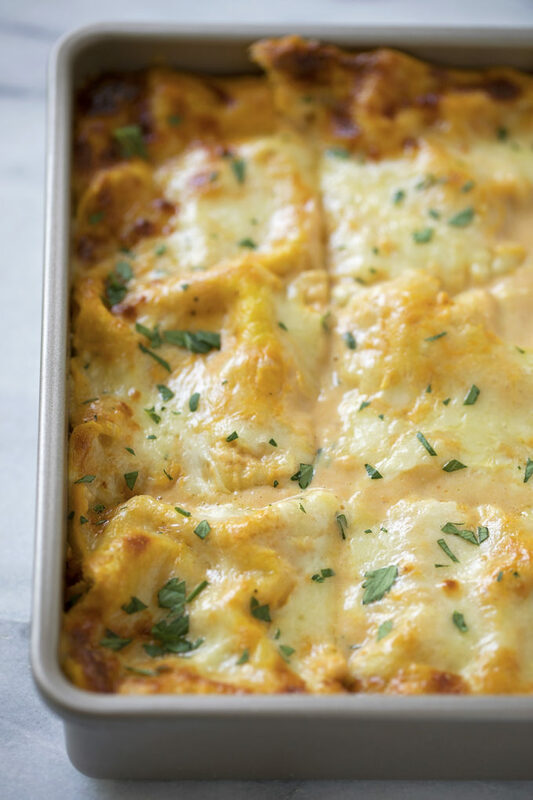 But then there are recipes like this pumpkin sausage lasagna that need to be shared. It’s too good not to! 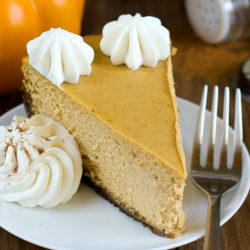 So for those of you that have a spare can of pumpkin in your pantry or extra puree stashed in the back of the fridge, you now know what to do with it! 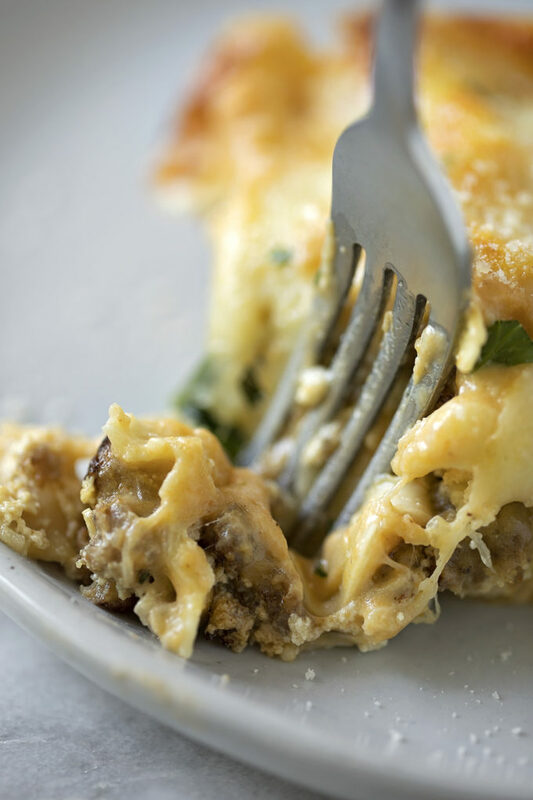 This recipe is made with a creamy pumpkin sauce and cheesy sausage filling. You’ll start by making the sauce. It’s pretty straightforward. 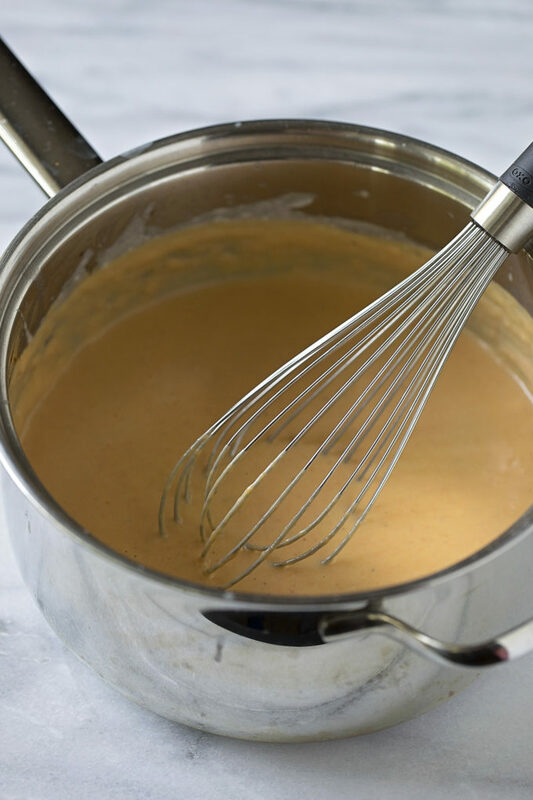 Melt the butter, whisk in the flour, add the milk, a few seasonings (a pinch of nutmeg really enhances the flavor), and then the pumpkin puree. In a skillet you’ll brown the sausage, saute the shallot and garlic, add the seasonings and wilt the spinach. If you don’t want to use spinach you can use kale instead. I personally prefer the taste of cooked spinach over cooked kale (especially if you are reheating it later on), and so do our kids. Once the mixture has cooled a bit, mix in the ricotta, egg, seasonings, and cheese. There are THREE kinds of cheese in this lasagna, which makes it ultra creamy and rich. 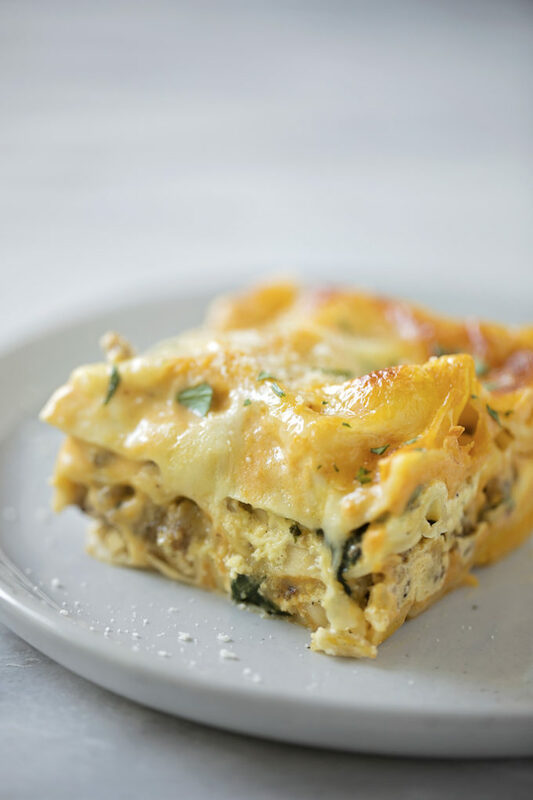 Layer the lasagna in a glass or metal 8×8-inch or 9×9-inch baking dish. I find that these are the perfect size pans for this recipe. The height is just right. 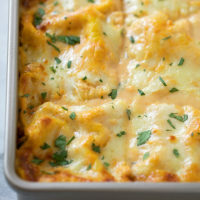 Bake the lasagna for 20 minutes with foil on top. This helps the noodles cook. The steam stays inside the foil instead of escaping into the oven. Then remove the foil and continue baking for an additional 20 minutes. I like to get the edges nice and crispy. Mmmmm. Let the lasagna stand for 15 minutes. This is a really important step for any casserole or layered hot dish. Giving it a little extra time lets those juices thicken up so when you cut in it comes out clean instead of a soupy mess. Garnish with freshly chopped parsley or crispy sage if desired. Serve it with a big garden salad and some good crusty bread. Enjoy! Preheat oven to 375 degrees. Set an 8x8-inch or a 9x9-inch dish or pan aside. In a medium saucepan set over medium heat, add the butter. Once the butter has melted, add the flour and whisk for 30 seconds. Slowly pour in the milk or half and half, whisking continuously until smooth. Bring the mixture to a simmer. Let thicken enough to coat the back of a wooden spoon. Add the salt, pepper, nutmeg and the pumpkin, whisk to combine. Remove from the heat. In a medium non-stick skillet set over medium heat, add the sausage. Cook until lightly browned, breaking it up into small chunks as it cooks. Add the shallot and garlic, cook for 2 minutes. Sprinkle in the red pepper and spinach. Continue cooking until the spinach has wilted, about 3-4 minutes. Remove from the heat. Mix in the ricotta, egg, sage, salt, mozzarella, and parmesan. In the bottom of the pan, add 1/4 cup of sauce. 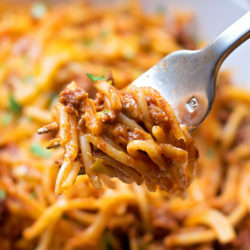 Layer noodles so that they completely cover the bottom of the pan (you will most likely use two, then break up the third one). Add half of the filling, then pour 1/3 of the sauce over top. Repeat by adding noodles, then filling, then sauce. Add the final layer of noodles, followed by the remaining sauce over top. Sprinkle the 1 cup of cheese over the sauce. Cover with foil and bake for 20 minutes, then remove the foil and continue baking for an additional 20 minutes or until the top begins to turn golden brown. Remove and allow to sit for 15 minutes before cutting and serving. Garnish with fresh parsley, if desired. 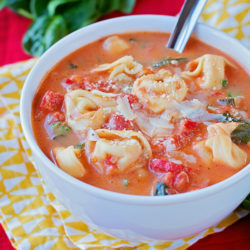 -To make this meatless, swap the sausage for 2 cups of sliced cremini or baby bella mushrooms. Cook in 3 tablespoons of olive oil until dark brown. Proceed with remaining recipe steps.